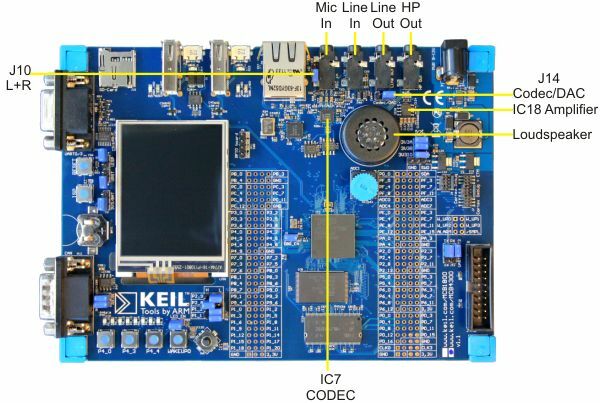 The MCB1800 board includes a speaker controlled by the low-power audio amplifier (IC18), and a low-power stereo coder/decoder (CODEC) for microphone and line-in inputs, line-out and headphone outputs(IC7). Jumper J14 (Codec/DAC) controls which source (DAC or the left channel of the line out output) is to be amplified and sent to the loudspeaker (SPK1). If a stereo microphone is used, installing a jumper at J10 combines the left and right microphone input signals producing a monaural signal for input to the CODEC.